Posted: June 16, 2017 6:00 a.m. The joint nursing program offered by the University of Regina and Saskatchewan Polytechnic may provide classes in both French and English starting in September 2018. Seven students will be accepted into the bilingual option in the Saskatchewan Collaborative Bachelor of Science in Nursing (SCBScN) program, pending federal approval. Classes will be offered half in French and half in English. A French immersion placement is also planned for the final year. 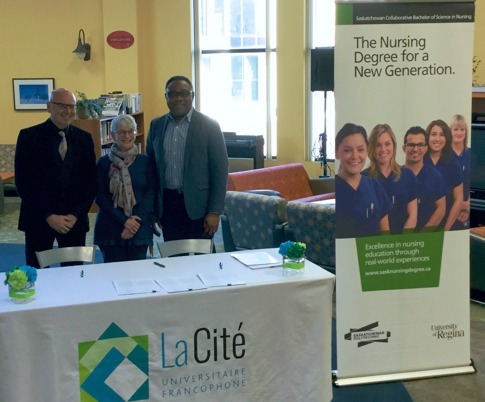 The program will be a partnership between the Faculty of Nursing, La Cité universitaire francophone at the U of R and Saskatchewan Polytechnic. In anticipation of the new program, two bilingual professors have been hired and will start next month. They will teach some English courses in the nursing program. Sandra Clermont-Pierre received her bachelor of nursing degree from the University of Ottawa in 2009 and a master’s degree in health services administration from the University of Montreal in 2013. She specializes in mental health and psychiatry. Dr. Léonie Mvumbi Mambu holds a doctorate in community health-clinical sciences from the University of Sherbrooke and a master’s degree in advanced practical nursing from the University of Montreal. Originally from the Democratic Republic of Congo, she worked there for more than ten years. She then worked as a registered nurse in various clinical settings, including in Montreal and Ottawa. If the federal funding is approved, registration for the bilingual option will open in October 2017. For more information please contact the project manager, Francine Proulx-Kenzle, at francine.proulxkenzle@uregina.ca or 306-533-3965.